DD Form 2755 - also known as the "Weight Based Assessment Of Military Postal Service - Incoming" - is a United States Military form issued by the Department of Defense. The form - often incorrectly referred to as the DA form 2755 - was last revised on May 1, 1997. Download an up-to-date fillable PDF version of the DD 2755 below or request a copy through the chain of command. 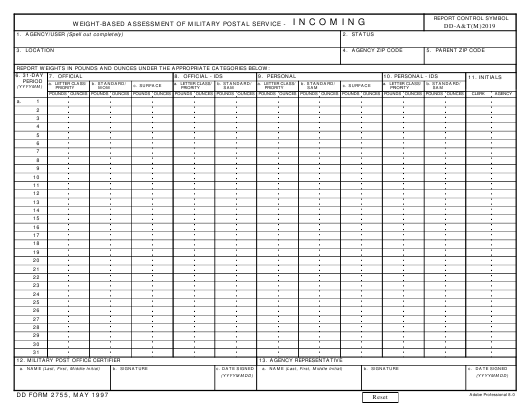 "WEIGHT-BASED ASSESSMENT OF MILITARY POSTAL SERVICE - INCOMING"
Example in Item 7a.) Those MPOs not receiving "Surface" mail, please leave blank. Surface mail data is only applicable to Incoming Mail. Found in "GREY" canvas bags. ment in this column. (See Example in Item 7a.) Found in "RED" bags with "MOM" tag. is only applicable to Incoming Mail. Found in "GREY" canvas bags.